Greenland’s massive ice sheet has melted this month over an usually large area, NASA has said. Scientists said the “unprecedented” melting took place over a larger area that ever detected in three decades of satellite observation. Melting even occurred at Greenland’s coldest and highest place, Summit station. Although about half of Greenland’s ice sheet normally melts over the summer months, the speed and scale of this year’s melting surprised scientists, who described the phenomenon as “extraordinary”. NASA said that nearly the entire ice cover of Greenland, from its thin, low-lying coastal edges to its centre, which is 3 km (two miles) thick, experienced some degree of melting at its surface. “When we see melt in places that we haven’t seen before, at least in a long period of time, it makes you sit up and ask what’s happening?” NASA chief scientist Waleed Abdalati said. 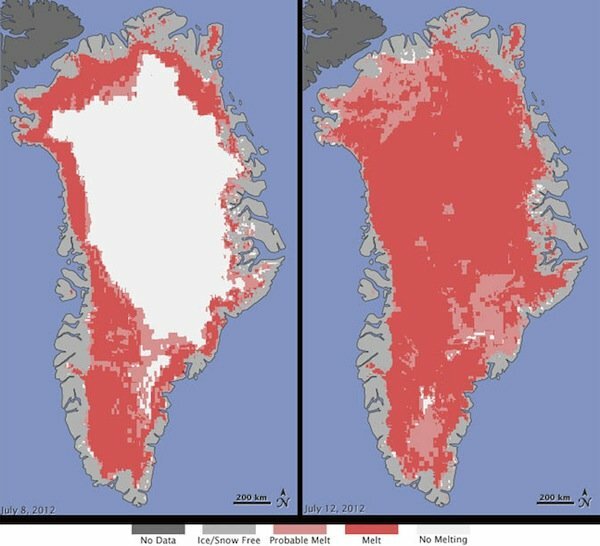 He said that because this Greenland-wide melting has happened before they are not yet able to determine whether this is a natural but rare event, or if it has been sparked by man-made global warming. Ice last melted at Summit station in 1889, ice core records show. The news comes just days after NASA satellite imagery revealed that a massive iceberg, twice the size of Manhattan, had broken off a glacier in Greenland. “This event, combined with other natural but uncommon phenomena, such as the large calving event last week on Petermann Glacier, are part of a complex story,” said NASA’s Tom Wagner.